The Hotelicopter is an April Fools' Day video prank that went viral showing a craft based on the Soviet made Mil V-12 military helicopter, leading millions to believe the world's first luxury hotel/helicopter was a reality. 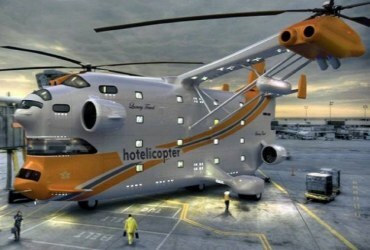 The video and website explained the first commercial flight of Hotelicopter was scheduled to take off on 26 June from JFK Airport in New York City, and reach the United Kingdom later that August. The Christian Science Monitor named the Hotelicopter as one of its top five online April Fools' pranks.